GPU glutton. 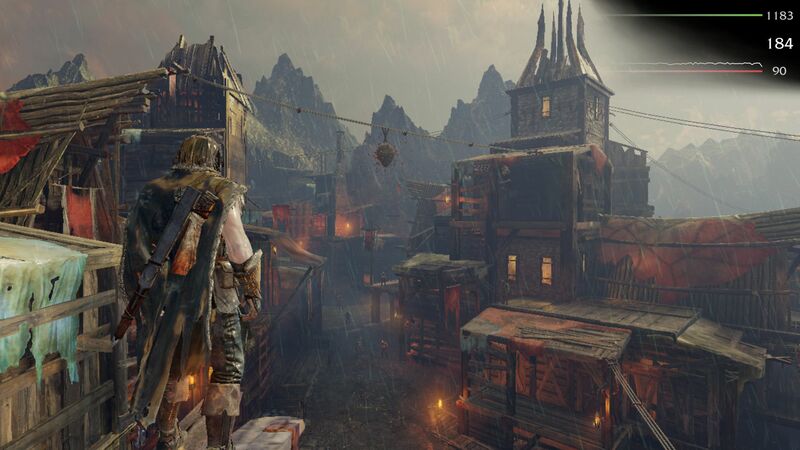 In Shadow of Mordor, Sauron does not aim for the ring but primarily goes for video memory. We tried to determine the hardware requirements. Do you really need a lightning fast high-end system? How much video memory does a graphics card require? This question is raised when buying the brand new scion of the Lord of the Rings universe. 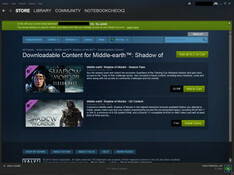 While 1 to 2 GB VRAM is sufficient for most games, 6 GB is recommended for Middle-earth. 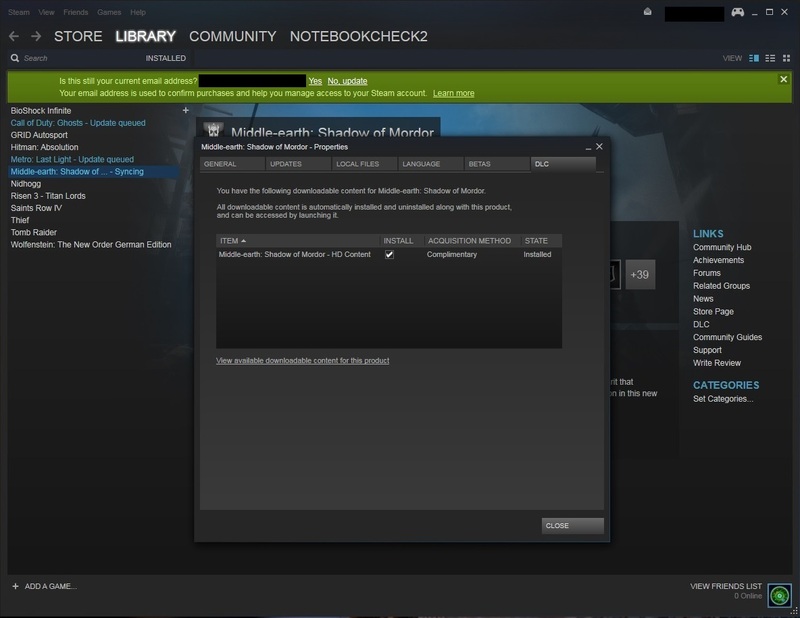 In 2014, a few other games (Watch Dogs & Wolfenstein: The New Order require 3 GB at ultra settings) also require more than 2 GB with maximum details. 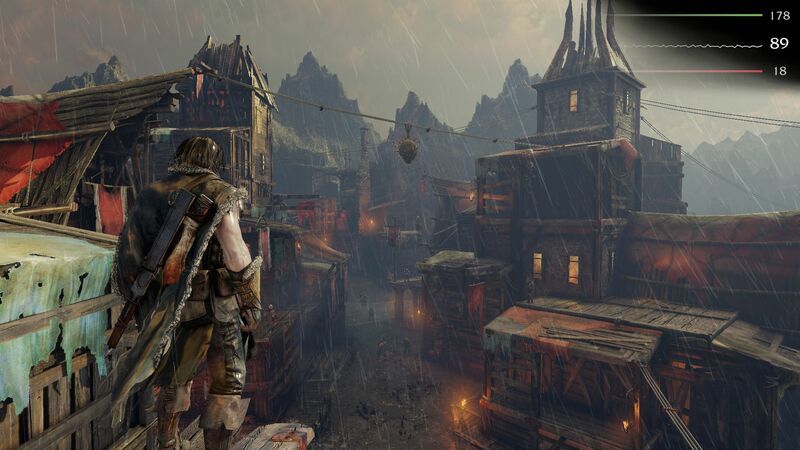 However, the requirements of Shadow of Mordor are definitely exorbitant. In view of the graphics quality, you might sooner or later suspect that Monolith (F.E.A.R., Tron 2.0, Aliens vs. Predator 2, No One Lives Forever...) was a bit lazy when optimizing their LithTech Jupiter EX Engine; at least at the PC. While most of the textures are razor-sharp and the technology is better than the competition's in many aspects (simulation of cloth), this does not justify such high video memory requirements. Shadow of Mordor looks good, yet not outstanding. Apart from facial expressions, polygon count and quality of effects should also be improved in some scenes. Let's return to the topic: If you want to enjoy Middle-earth in all its glory, you have to manually download and install the texture package via Steam first (see screenshots). If you skip this, only high textures are used with ultra settings and image errors might occur. Our tests proved that 6 GB VRAM is not absolutely necessary for maximum graphics options, but, with less memory, you'll face stuttering and slowdowns, which have a big, negative effect on the gaming experience. Previous to the launch of the GeForce 900 generation, only the top models of the GeForce GTX 870M (6 GB) and the GeForce GTX 880M (8 GB) could meet the high memory requirements in the notebook range. This gets especially apparent in the minimum fps. Instead of 26 fps, the predecessor of the GTX 870M only reached 11 fps (GTX 770M @ 3 GB) at ultra settings. Likewise, the GTX 780M with 4 GB VRAM stuttered more than its counterpart of the 800 series. 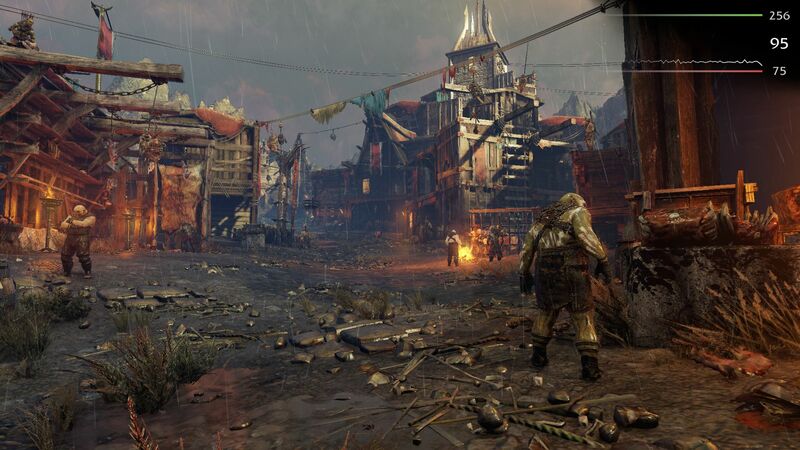 While the performance was comparable otherwise, the minimum fps were more than 50% lower (13 vs. 30 fps). Since the texture quality at ultra settings hardly differs from high settings, we would recommend omitting the HD package and playing with the (very) high presetting if possible. In dropping ultra textures, not only the average fps will increase, but especially the minimum fps. Not only the video memory requirements raised discussion in advance, the CPU requirements did too. According to Monolith, you'll require a quad-core CPU. Don't panic: Reasonably powerful dual-core models like the Core i5-4340M are sufficiently fast. However, a lot of storage is required. 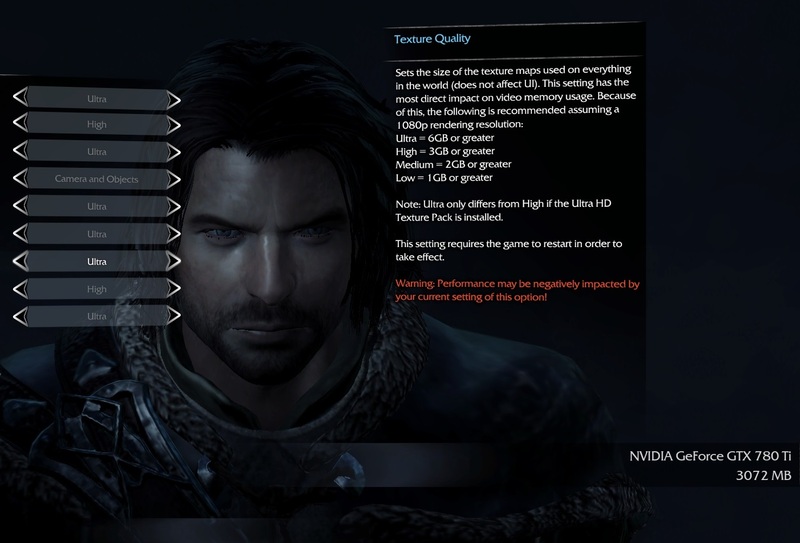 Shadow of Mordor with high-res textures (~4 GB) occupies over 40 GB on the hard drive. Otherwise, you can hardly complain about the technical implementation. The enhanced options menu brings more than 10 options. Apart from Ambient Occlusion, the DirectX 11 engine also supports other "graphical gems" like tessellation. The video menu allows changing the resolution, configuring the display mode, and activating vertical sync. 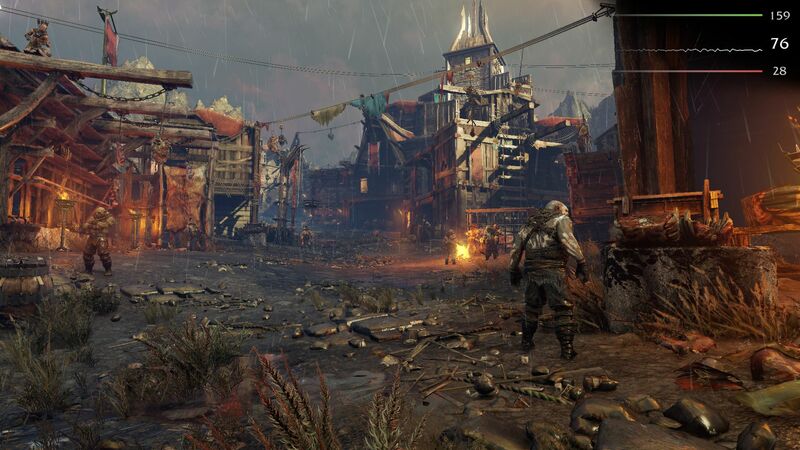 In addition, not every game allows limiting the frame rate. Unfortunately, Shadow of Mordor requires being restarted after specific changes. This would not be a problem if you could skip the intro video. 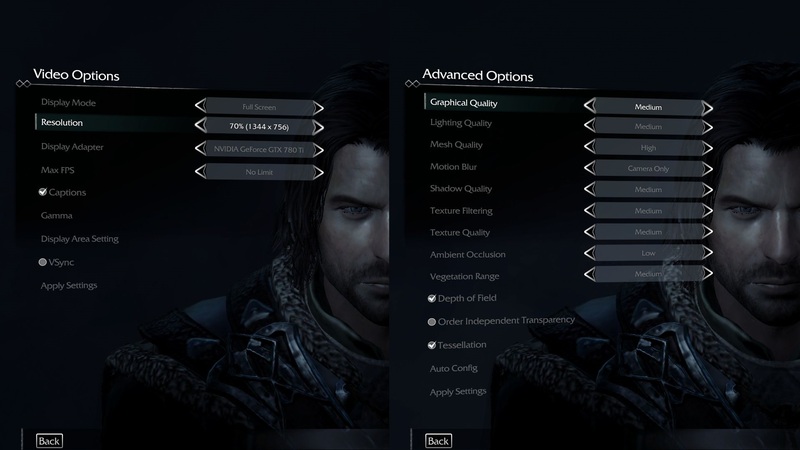 It is also annoying that Monolith did not implement anti-aliasing. Jagged edges are an issue in Middle-earth - see "overhead wiring" in the video. While Nvidia platforms deliver rather constant frame rates, they partly fluctuate extremely in AMD systems. This gets especially apparent in the diagram of the integrated benchmark. 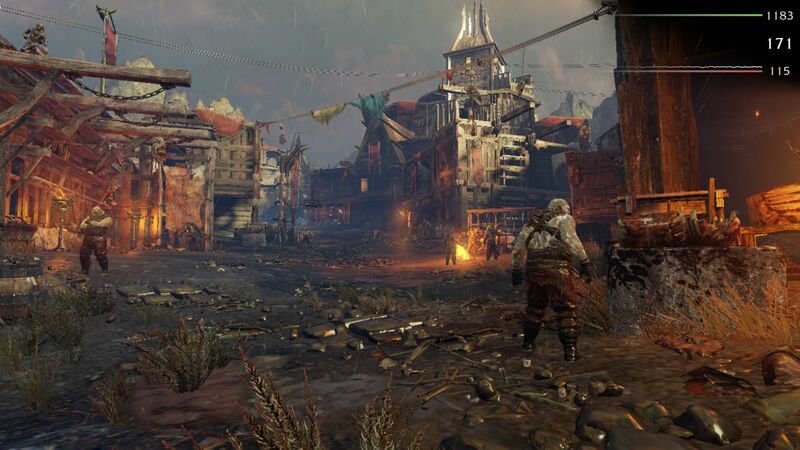 In general, the minimum fps varies greatly - regardless whether run on an Nvidia or AMD platform. The minimum is usually higher in the second benchmark run. Weaker AMD processors often falter. Only low to medium details are possible with Intel HD Graphics 4600. The game crashes with "high" setting and above. With low to very high setting, the performance is hardly different with or without HD texture package (tested with GeForce GTX 780 Ti). 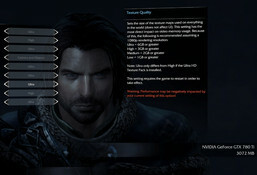 The options menu only displays the Intel chip instead of the Radeon in AMD notebooks with Enduro graphics switch. Nevertheless, the settings can be configured as usual. It seems that the integrated benchmark starts recording a few seconds too early. In any case, the maximum fps is much too high. 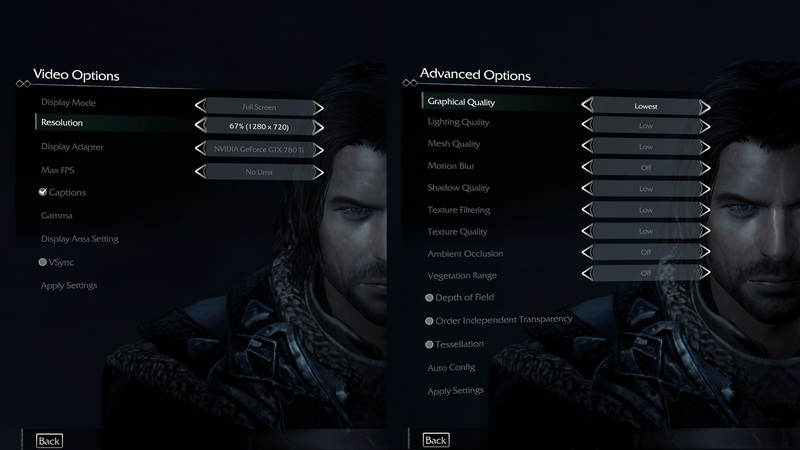 In contrast to the other options, the "graphical quality" is not changed after restarting the settings. Restarting again helps here. As already mentioned, we used the integrated benchmark for our measurement, which can be directly run from the option menu. Although it is not particularly representative for the real game (frame rate reduction due to VRAM overflow), we decided to use this sequence, which takes just under 40 seconds, because of comfort and identical passes. It would also be hard to recommend hardware for specific settings based on a "real" in-game benchmark. This would require a more constant performance of the game. So, the GPUs listed below are only a rough estimation based on minimum and average fps of the benchmark. Those only owning a cheap office or multimedia notebook can save about 50 Euros (~$63) due for the game. Neither the HD Graphics 4000/4600 nor mid-range chips like the GeForce GT 740M can handle it. 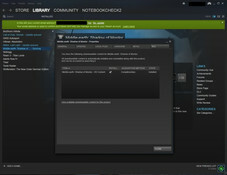 At least a GeForce GT 750M is required to smoothly run the game with a resolution of 1280x720 pixels and "lowest" level. Not less than a GeForce GTX 850M or GTX 765M are necessary for 1366x768 pixels and normal settings. The high presetting and 1920x1080 pixels only run adequately on a top GPU. Both the Radeon R9 M290X and the GeForce GTX 870M achieve an average of above 50 fps. You should not use the ultra presetting because of the reasons mentioned above. All of these used Windows 7 64-bit as operating system. Thanks to Micron for providing us with a 480 GB Crucial M500. In addition, there are benchmarks from other notebooks with probably different drivers.